The battle to keep the home cool and saving money on electric bills seems never-ending. There are ways to drastically reduce your energy use and keep the home cool by installing a whole house fan system. Whole house fans can be placed in a central location of the home, such as an attic and used to pull in fresh, cooler air from the outdoors. This provides a cooling for the entire house, especially when used during the cooler parts of the evening and morning. They are nearly silent to operate and offer effective relief from the high temperatures of summer. Pacific Power & Gas estimates that the average household saves at least 90 percent on their energy use with whole house fans, rather than traditional compressor operated AC units. This translates to a significant reduction in energy costs every month. You save without without compromising on the quality of home cooling. When the system is operated during the cooler hours of the day and evening, it will produce a lasting cool for the hotter portions. There may be times you want to run the AC, but it is limited and for a short duration. 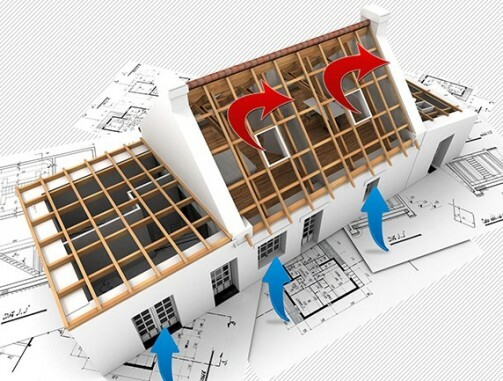 Whole house fans can cool the main areas by as much as 30 degrees and up to 50 degrees in the attic. You will notice an immediate difference in the air temperature when the fan is started. Use of a whole house fan will bring new air inside the home anywhere from 12 to 15 times per hour. The constant flow of air that is naturally cooler than the internal temperature of the home provides the cooling effect. There are very little parts to purchase and install with this type of cooling system. The cost of adding a whole house fan versus a larger, or secondary AC system are dramatically smaller. The cost savings on your electric bill will pay for the unit quickly. Contact an expert in home renovations like Teknic Inc for an estimate on the installation of quiet cool systems right now!